While the icy grip of winter closes ever tighter on every other corner of this country, here on Arizona’s west coast we have watched as winter disappeared in January and February, with winds much calmer than usual and the sun’s rays turning a cool January morning into an 80 degree sunshiney day. I’m really a winter person. I was a child in Minnesota, where wind chills less than -40 were not a good excuse to miss school or (especially) sledding, where we had things like mudrooms and fireplaces, and we changed our shoes Mr. Rogers-style when we went inside. 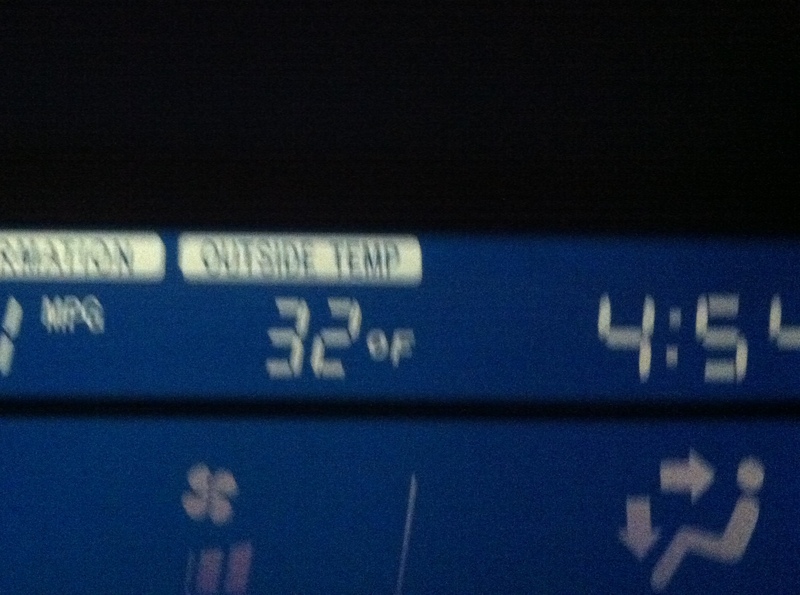 But here I am in the desert, and even I have enjoyed driving with the sunroof open and the windows down! Birding has been decent in this warm early spring. Another trip to Cibola with David turned up more shorebirds on Hart Mine Marsh: American Avocets and Long-billed Dowitchers. 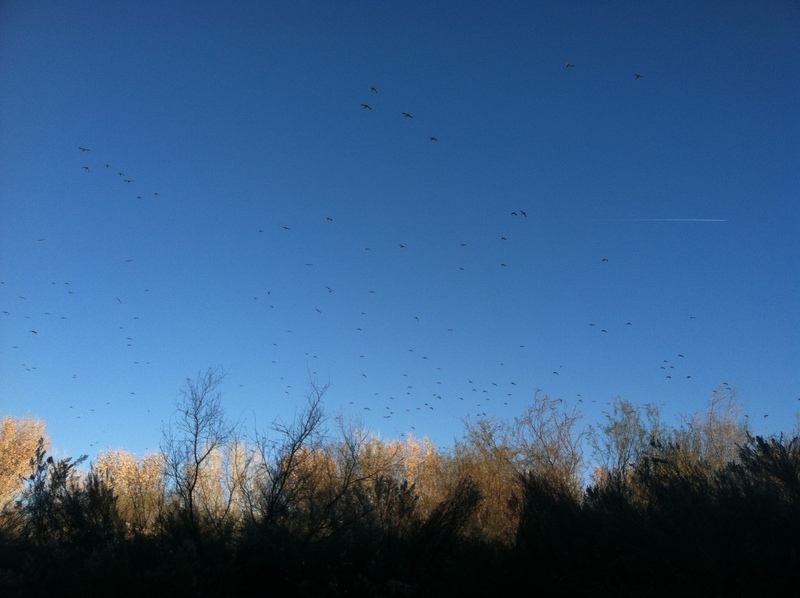 We spent an hour and a half at the Awesome Goose Pond adjacent to Nature Trail, studying geese until our heads hurt. This produced one good year bird, Greater White-fronted Goose, along with a cool hybrid and five Cackling Geese. 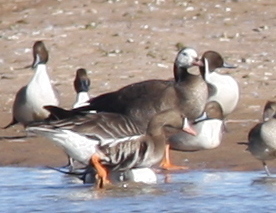 Greater White-fronted Goose and a hybrid of that species. 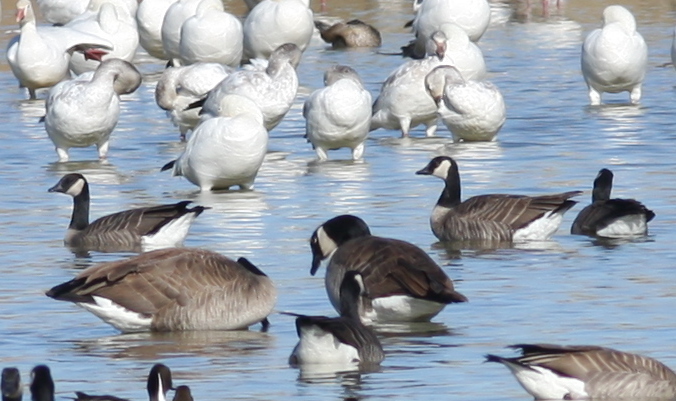 Initially identified as half Canada Goose, but I suspect now that the other parent was a Cackling Goose. 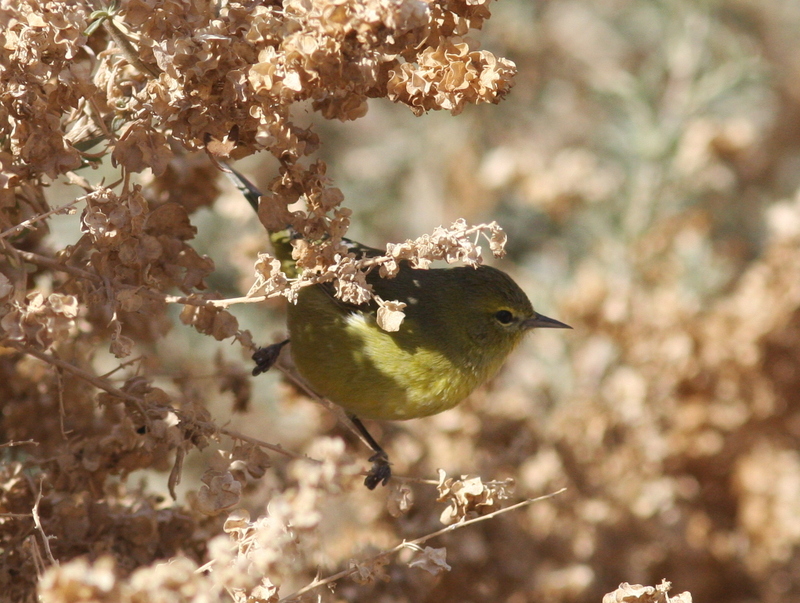 Figuring flocks of hundreds of Audubon’s Warblers always have something to offer, I decided to try that route again. Okay, that’s not true. I had a spare morning so I went to the end of Planet Ranch Road to walk the desert route and find Black-throated Sparrows. What I didn’t foresee was that I would be held up about an hour by the budding cottonwoods sagging with the weight of all those 15-gram birds. 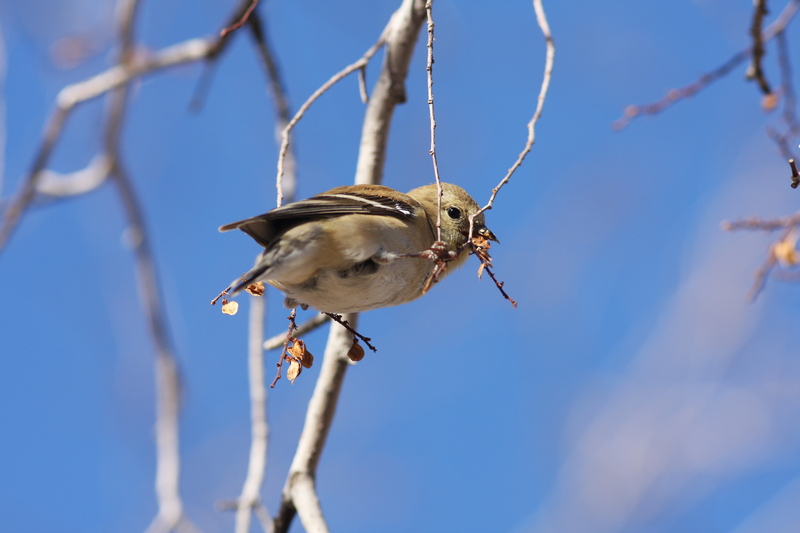 Those included a low-end rarity, Plumbeous Vireo, and a common migrant that is very rare in winter, a Townsend’s Warbler. Also, another low-end rarity that weighs significantly more than 15 grams: a Western Scrub-Jay, a holdover from this fall’s invasion which I had also been hoping to find. 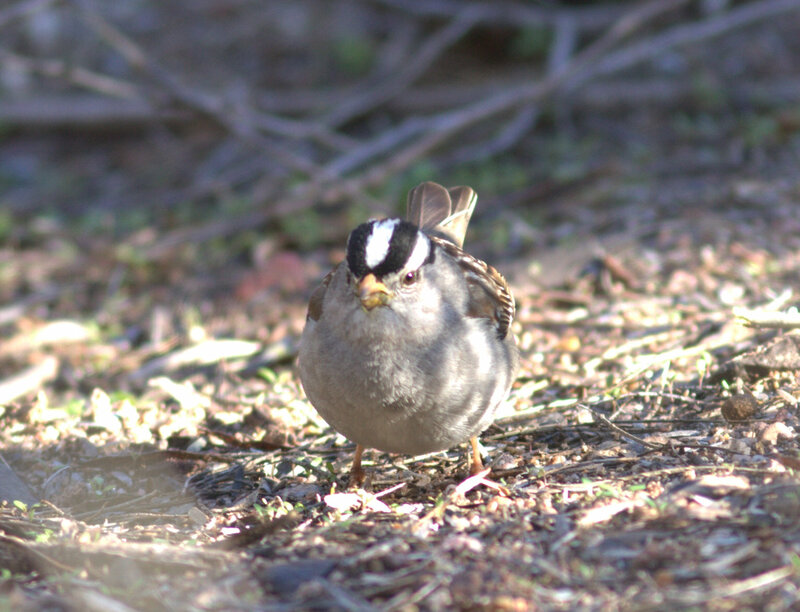 And the Black-throated Sparrows, probably the most abundant breeding bird in La Paz County, were right where they were supposed to be up a nice desert wash.
For our last La Paz trip in January, David and I took a day and visited the legendary Alamo Lake. Last year’s spoils on that far-off isolated lake? 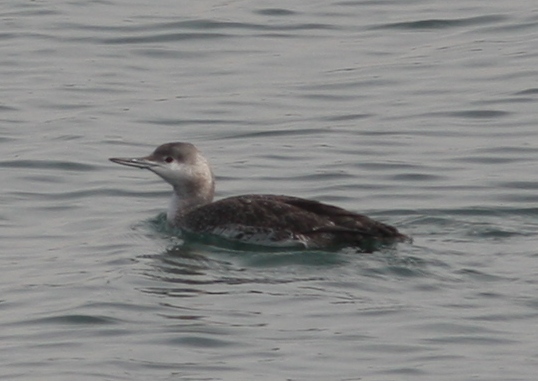 Red-necked Grebe, Mew Gull, Lesser Black-backed Gull. 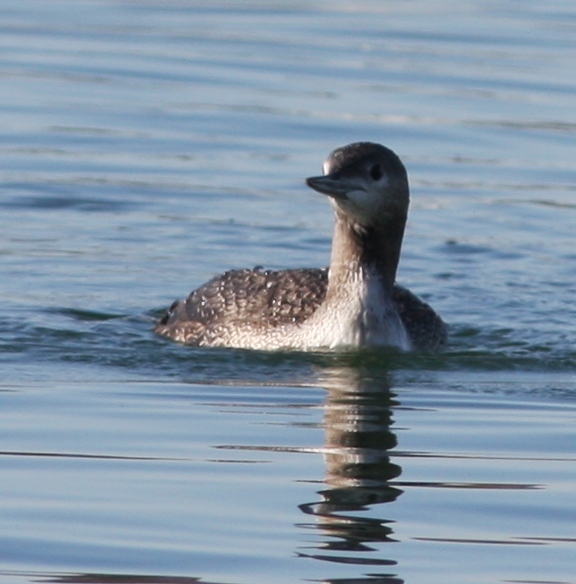 This year…well, there were a whole lot of Western and Clark’s Grebes. So far, anyway; it’s still early! 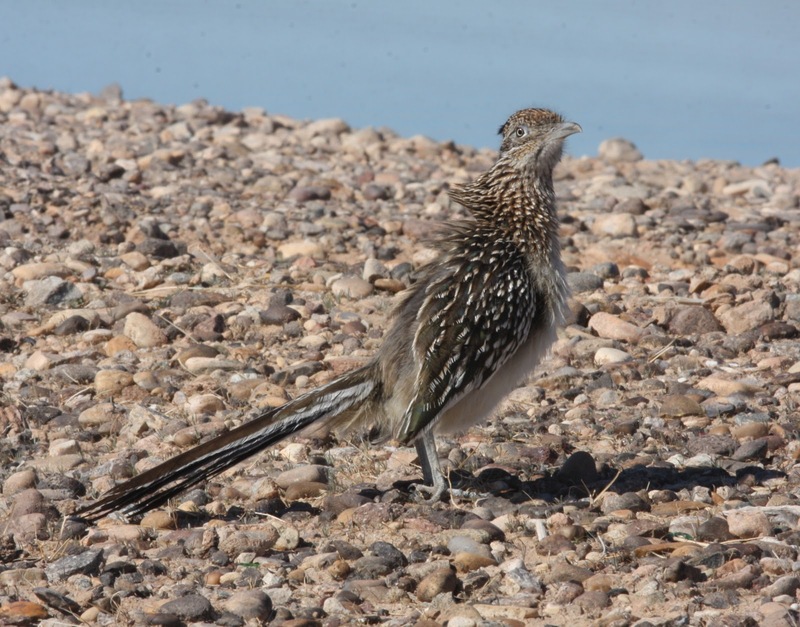 The upshot is that we spent a few hours on the drive there looking for desert birds, especially thrashers. 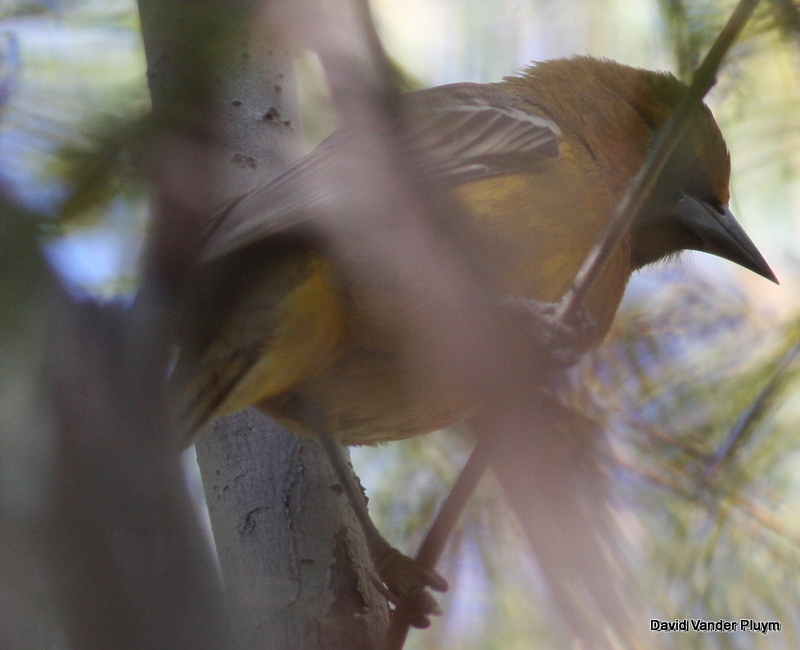 No Le Conte’s or Curve-billed, but a Sage Thrasher was a county bird! 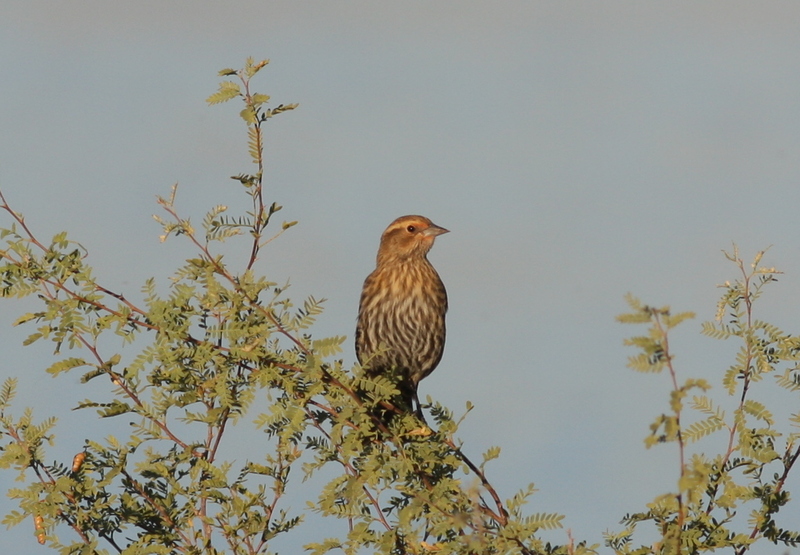 Another county bird was mixed in with some nice sparrow flocks: we had several Sagebrush Sparrows. February has been a little slow so far. Lots of fabulous continuing birds, but I haven’t had much time to go birding since returning from a brief trip to Florida. Still, I have picked up a few year birds: a Bell’s Vireo at ‘Ahakhav, two American White Pelicans flying up the Bill Williams River (#150! ), and a flock of early returning Cliff Swallows. The next few weeks should turn up more early spring migrants, like Blue-winged Teal, White-winged Dove, Black-chinned Hummingbird, and Violet-green Swallow. Maybe I could finally find a Dunlin, too…? 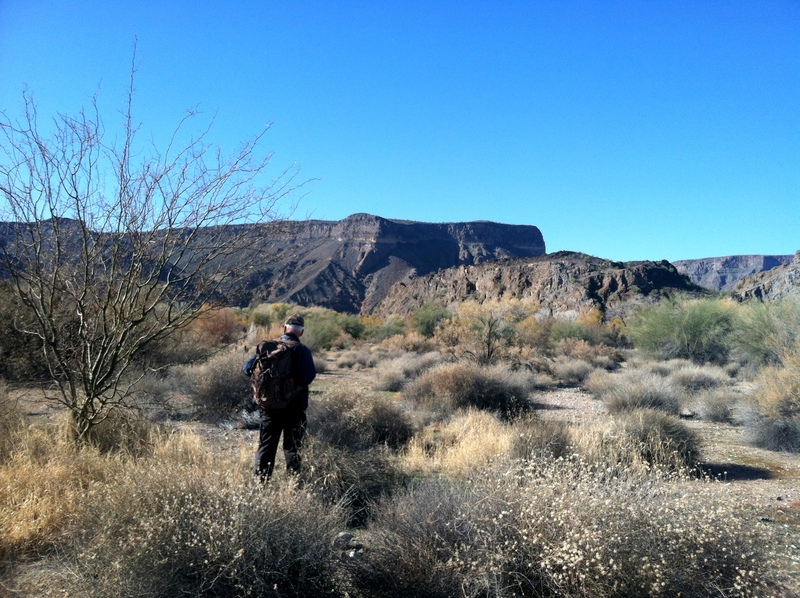 I admit it: it’s 15 days into the new year, and I’ve only made five trips to La Paz County. Meetings and deadlines have done plenty to keep me busy, and daily gusty winds have done their part to keep me inside. Still, two of the trips I’ve made since January 1 have landed me Year Birds, including some excellent rarities. 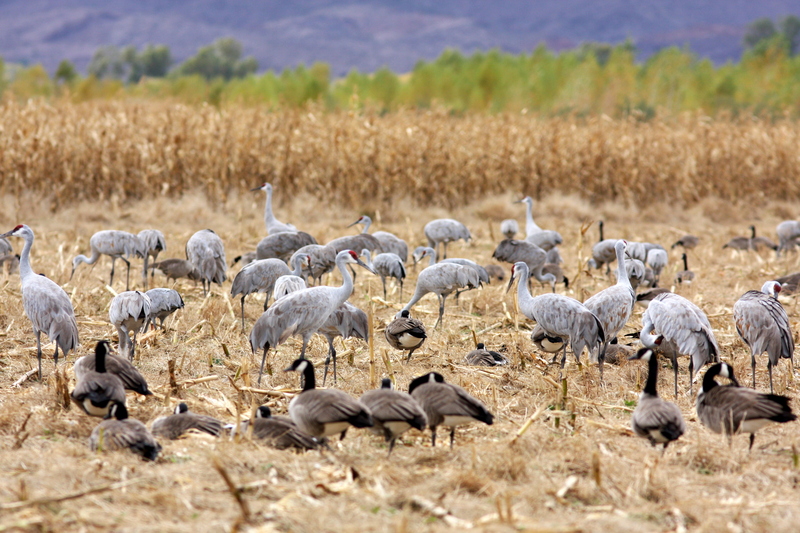 Since David and I were driving to Tucson on January 3, I thought we could make a few stops along the way to try to pick up a few county birds. 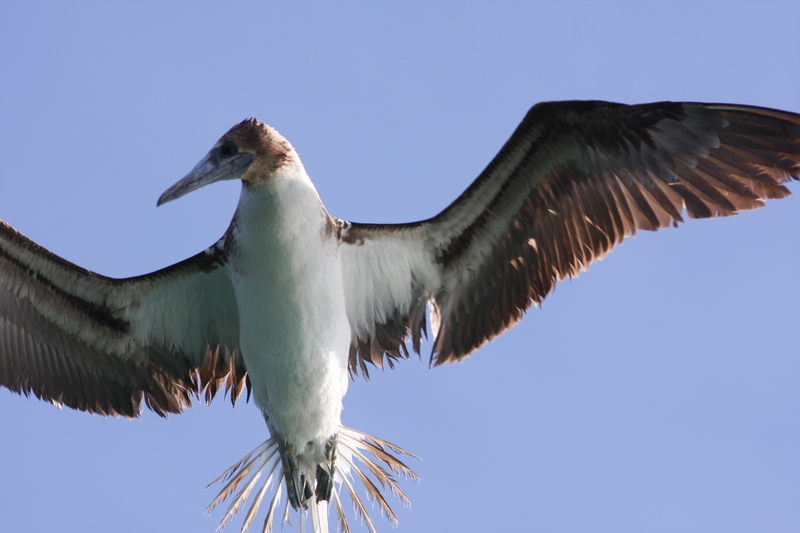 Most pressing on my mind were the Nutting’s Flycatcher and the Blue-footed Booby, rarities I would be very disappointed to miss on my Big Year. Accordingly, we left early for the Bill Williams January 3. We stopped briefly at the hilltop overlook of the Bill Williams Delta, hoping for a sighting of the elusive Blue-footed Booby. 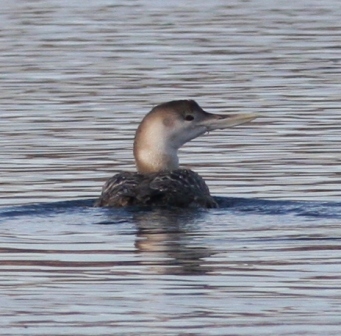 I was also still thinking of sly mergansers; Common was my biggest Big Day miss and Hooded had eluded me as well. 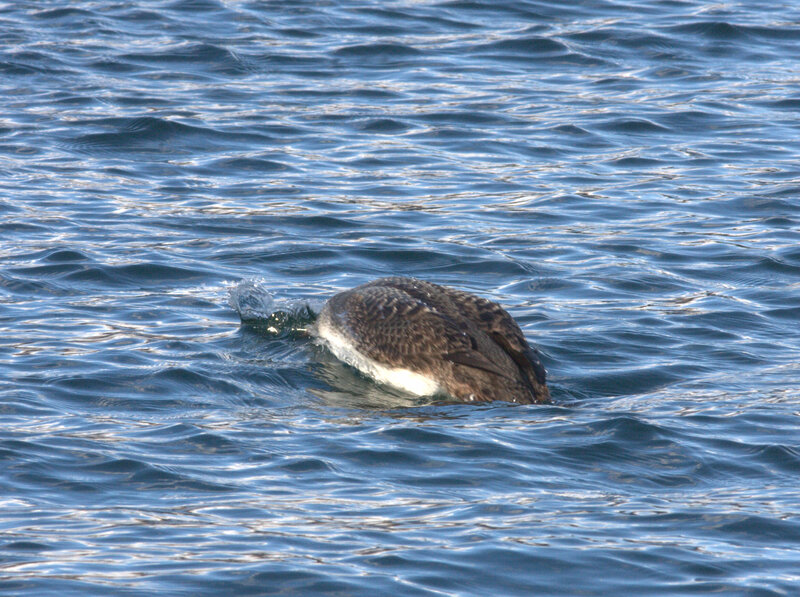 We saw not a single Common Merganser on the water, but Hooded came through feeding in the shallow inlet near the hill. I also apparently picked up Ruddy Duck, which I must have forgotten to write down anywhere on my Big Day (I probably picked it up first at Hart Mine Marsh)! No, this discovery actually doesn’t affect my Big Day total. 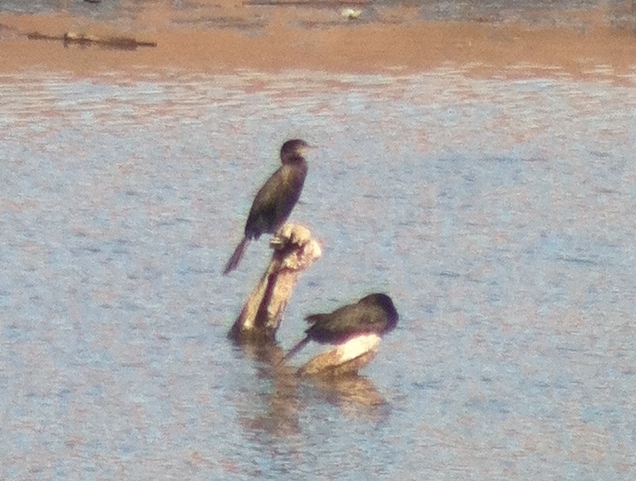 While entering my lists into eBird, I discovered that I had written down and counted Double-crested Cormorant twice. After the usual dip on the booby, we cruised down Planet Ranch Road and stopped at Mosquito Flats. 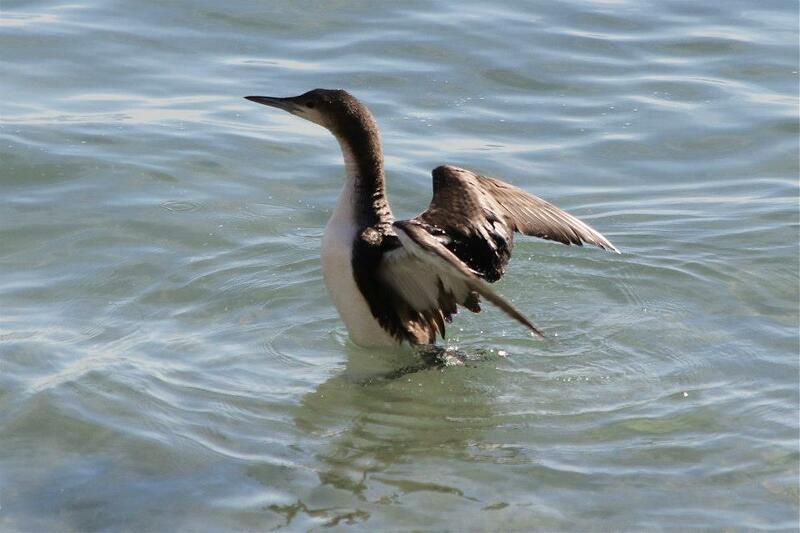 Two birders were way down the road, waving their arms: clearly they were on the bird. I hustled down the road until I heard WEEEP! All I really needed was to hear the bird, and I was keen to find the Golden-crowned Sparrow that is wintering in the same area, so I cut off the Nutting’s hustle. I believe this may have left the other birders bewildered. Sorry about that, other birders, and thanks for the arm waving! 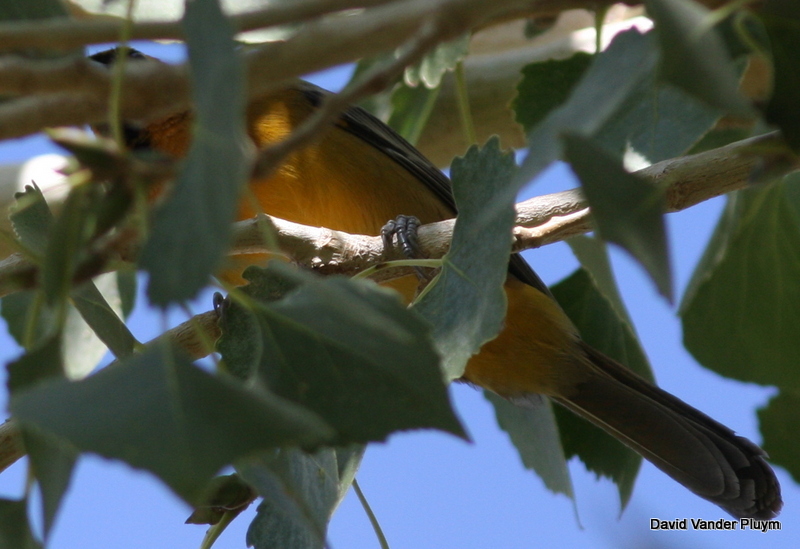 No La Paz County Big Year can even start right without Nutting’s Flycatcher! 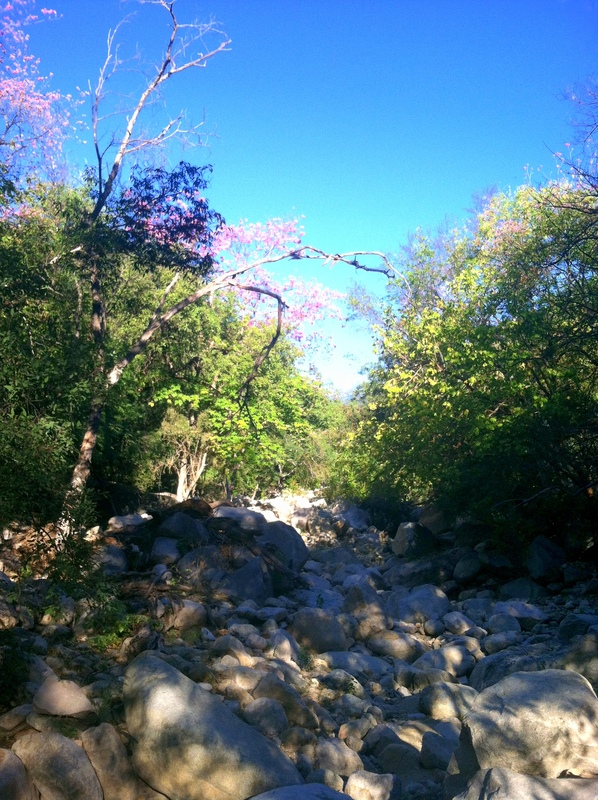 Mosquito Flats was rather active that morning, and I picked up new species like American Robin calling from the forest, and Rock Wren calling from their favorite Rock (where they were silent on January 1…). While the Golden-crowned Sparrow didn’t show up, the continuing Hammond’s Flycatcher did put in a brief appearance. A good bird to pick up in January. 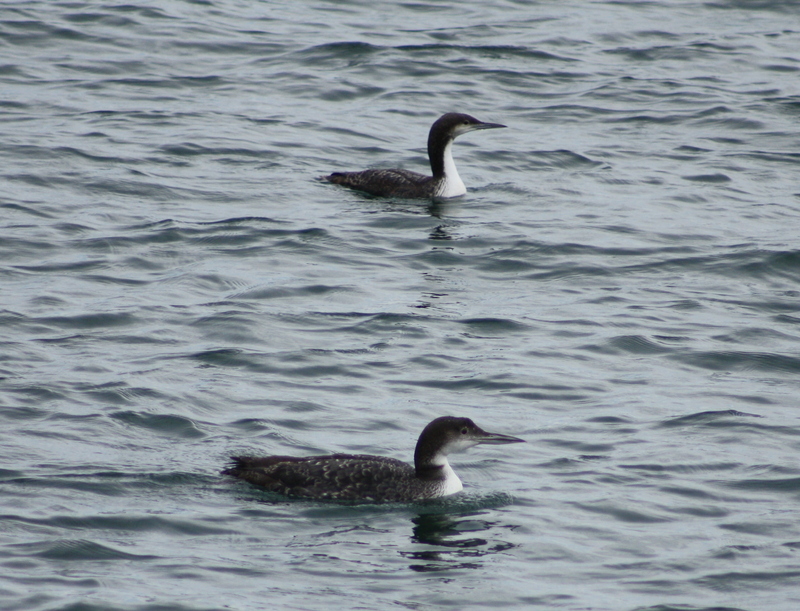 Back at the refuge headquarters, we continued to not see Blue-footed Boobies or Common Mergansers. David did pick out the “brrt” of a flyover Northern Rough-winged Swallow. We continued down to the Parker Valley. I pulled over at a flooded field full of White-faced Ibis, and David and I both estimated the flock and came up with about 900 birds, an excellent count for winter. The other prize for the stop was a briefly heard “deet dee dee!”, a Greater Yellowlegs. 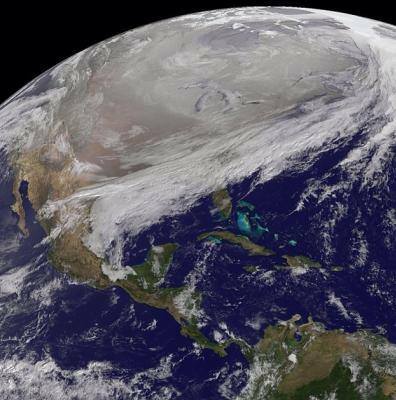 This species shouldn’t be difficult in winter, but I’m having some trouble finding the flooded fields they prefer. 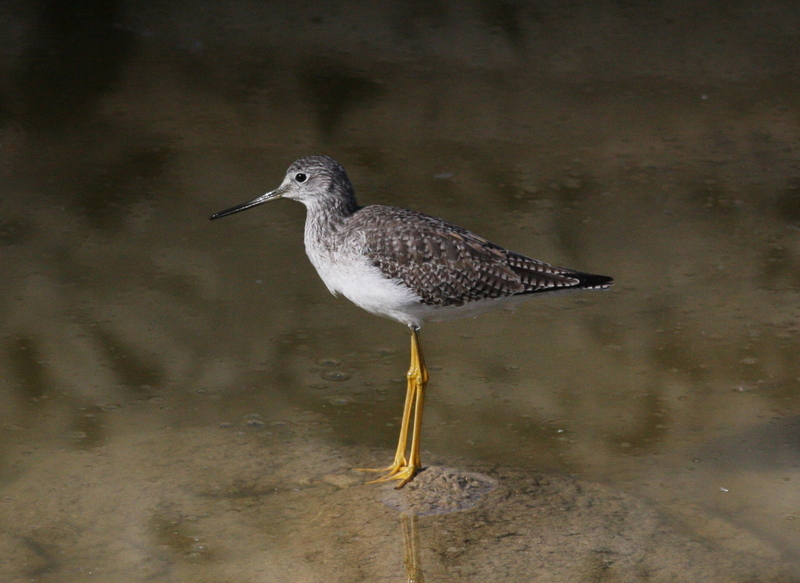 Greater Yellowlegs: Check. Now I need its friends Long-billed Dowitcher and Dunlin. 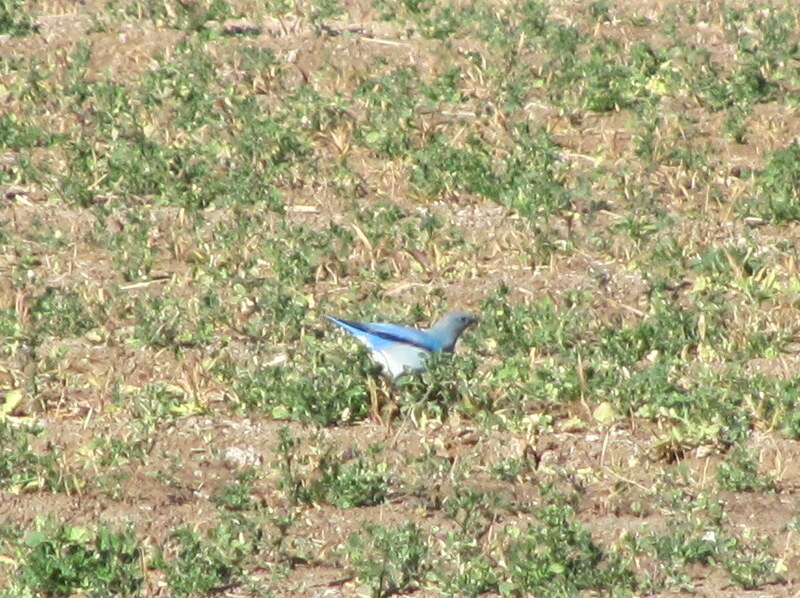 We continued south, stopping again to check the fields where Mountain Plovers had been January 1. 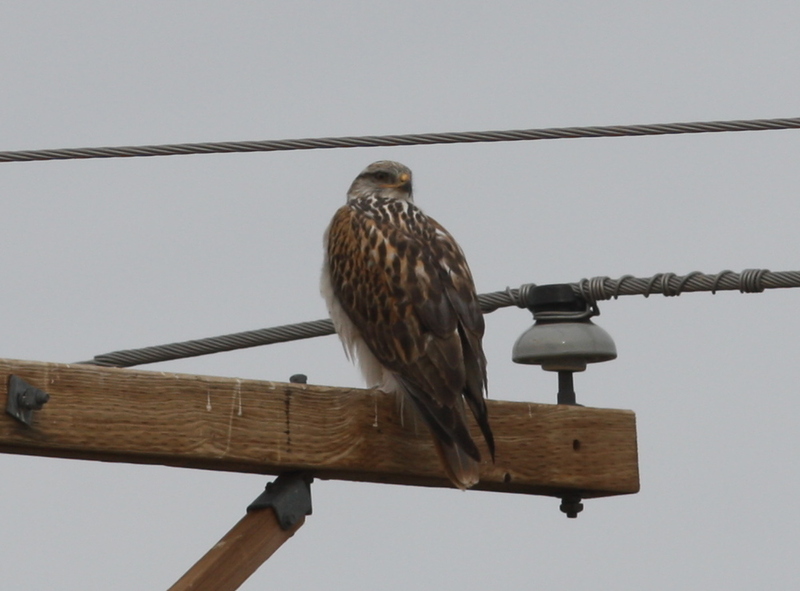 Although the Mountain Bluebirds held fast to their powerline perches, the plovers had gone. We drove down a dusty side road, where hundreds of sparrows would perch tantalizingly in the open only to disappear the moment we tried to look at them. It took quite a bit of sneaking before David spotted both Vesper and Brewer’s Sparrows among many White-crowned and a few Savannah Sparrows. 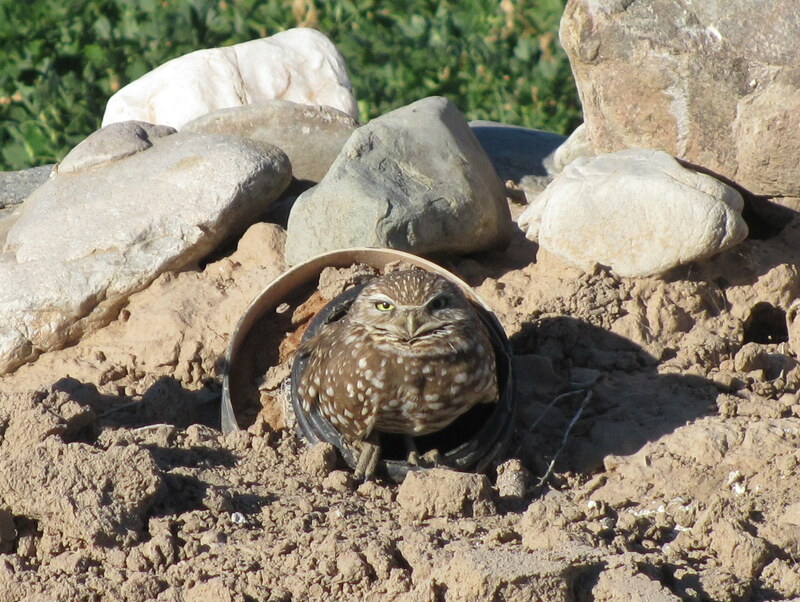 We also made a brief stop at Quartzsite on the way to Tucson, but it was quite birdless. On our way back, we checked out Vicksburg, where we found a sludge pond tucked away behind one of the dairies. No birds, but good to know about for the future! 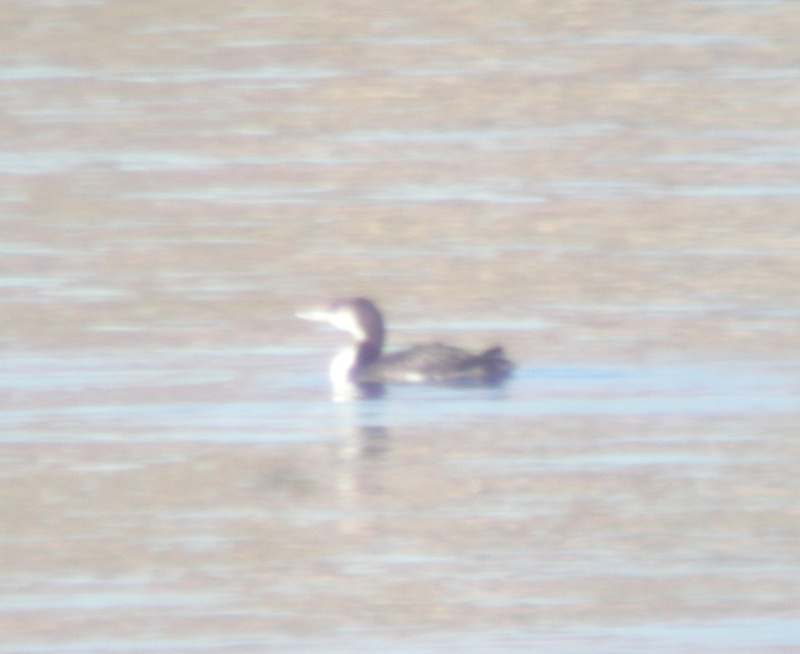 We stopped again at the Bill Williams Delta and again lacked booby and merganser. 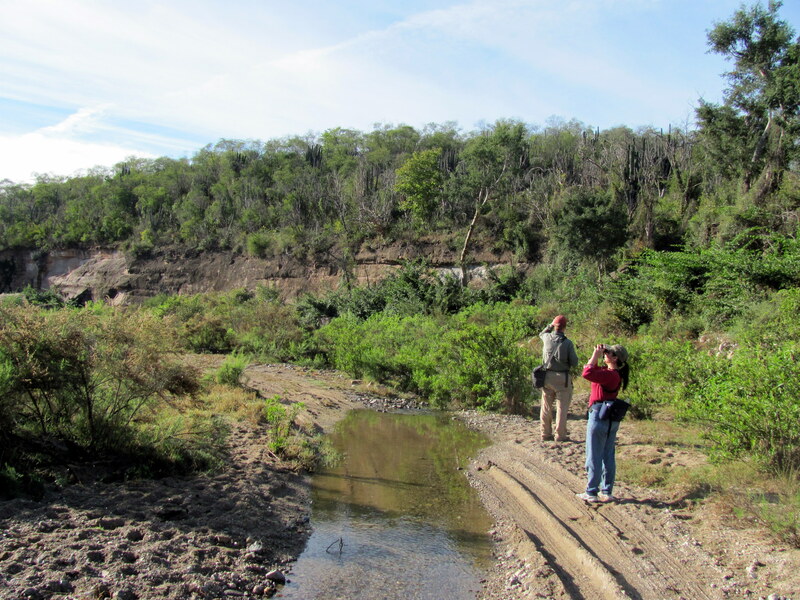 A week later, friends Frances Oliver, Linda Pittman and Karen Zumwalt ventured east to Arizona to look for the Nutting’s Flycatcher and other goodies. At Mosquito Flats at dawn, the Nutting’s was perfectly cooperative and we enjoyed great looks. A sparrow lurking at the edge of the road turned into a lovely Golden-crowned Sparrow, and as we watched it, a surprise FOX SPARROW popped out of the brush! Not only a Year Bird, but a County Bird for David and I! Mosquito Flats rarely disappoints. In fact, while we were watching the flycatcher, a lanky shape darted over the treetops in and out of view: a Common Merganser! We also stopped at the Bill Williams Delta, where everyone enjoyed good views of Barrow’s Goldeneye. Then, with his eyes to his scope, David called out, “Lauren!”. I wasted no time getting there and rested my eyes upon the distant Blue-footed Booby loafing on Heron Island. Awesome! 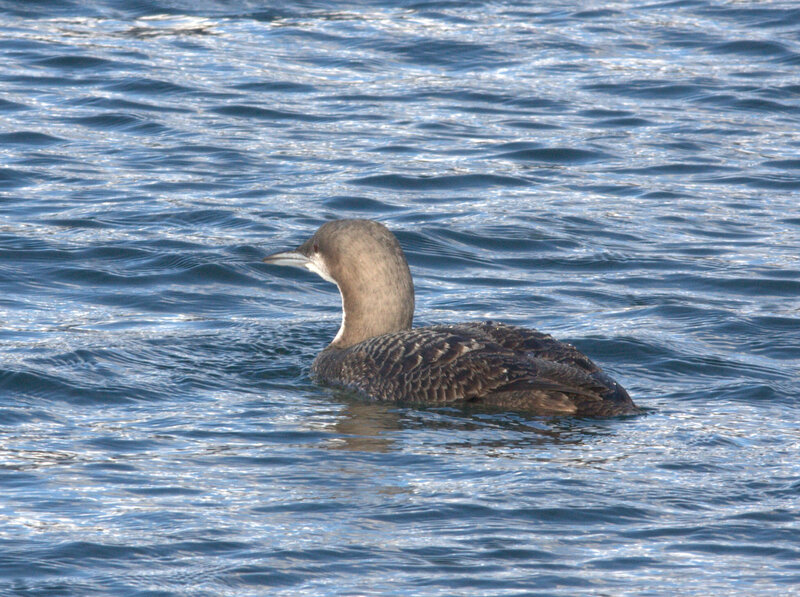 Hopefully this great bird continues to use this roost site where it can be found by birders. There is still plenty to do this January. 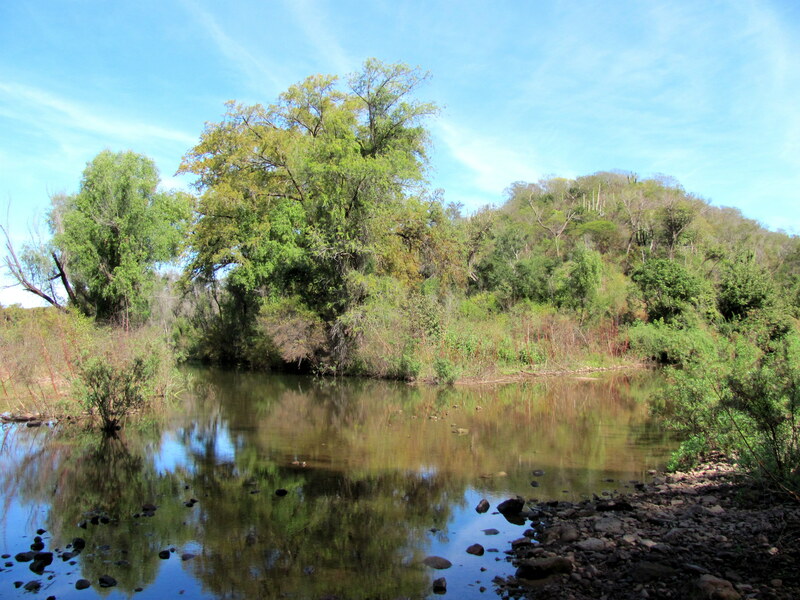 I’d like to take a trip to Cibola to look for the Red-shouldered Hawk at CVCA (it would be nice if it were on the Arizona side) and a Black-and-white Warbler at Nature Trail found by Donald Sutherland. Paddling the Bill Williams, I may be able to find Green Heron, American Bittern, and rails. 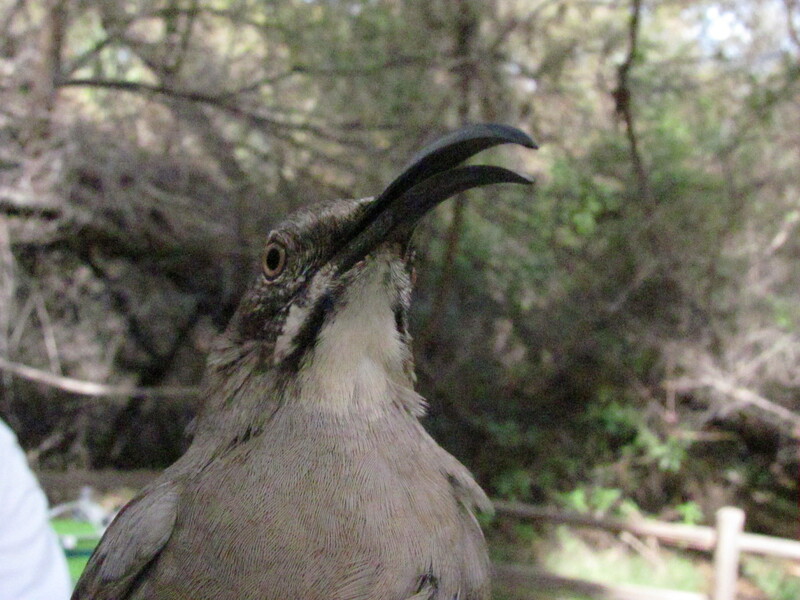 A desert venture could produce LeConte’s Thrasher, and a trip to the mountains could include a scarce wintering Gray Vireo. 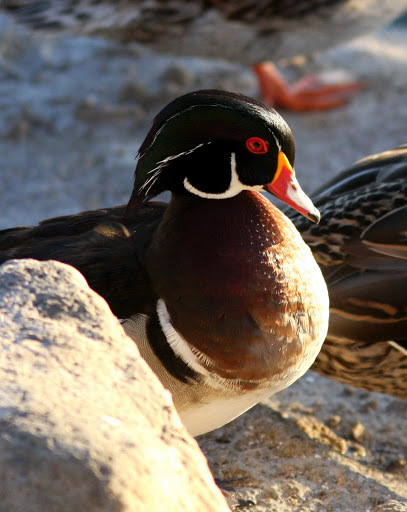 Who knows what good birds are hiding out at Alamo Lake or the high Harquahalas. 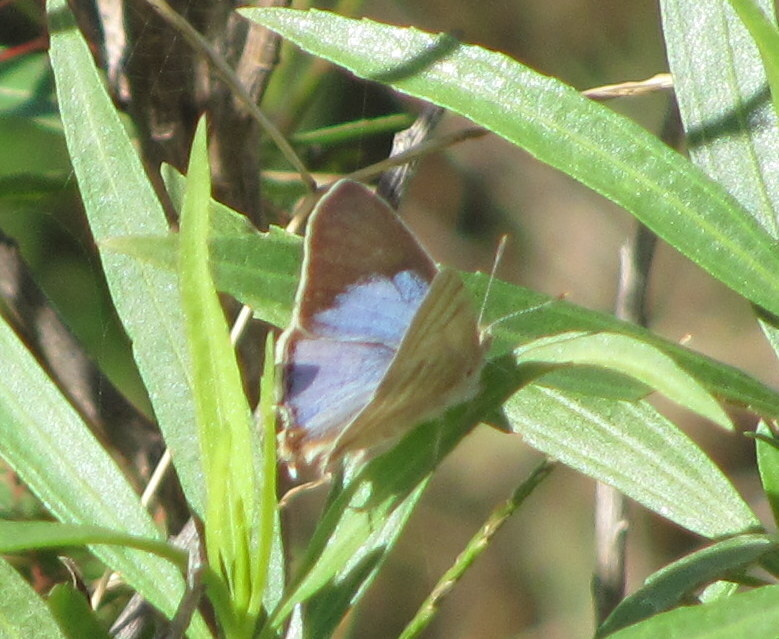 I’m sure there are still rarities to find in the Parker Valley along with wintering Bell’s Sparrows. The Christmas Bird Count season is always an exciting time of year, with more eyes and ears out in the field looking at birds, gathering data and finding rarities; birders getting together, seeing old friends and meeting new people; and of course it’s a good reason to explore new areas! This year I had the time and motivation to participate in four counts: Alamos in southern Sonora, the south end Salton Sea, and my two local counts, Bill Williams and Havasu. All were fun and good experiences for different reasons! The Alamos CBC was December 14, the first day of the count period. 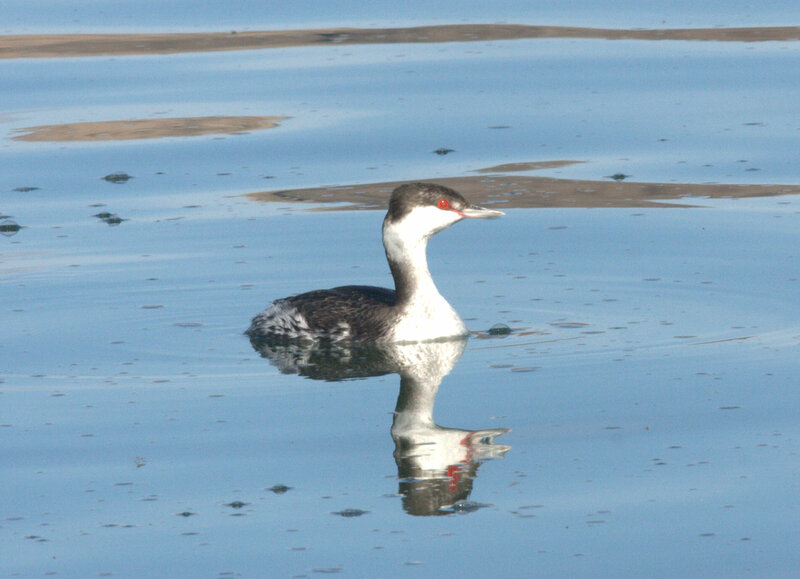 I was invited to go with Dave Stejskal, a friend and veteran Sonora birder. We drove down (about a 9-hour drive from Tucson) two days before the count with Carol Tepper. 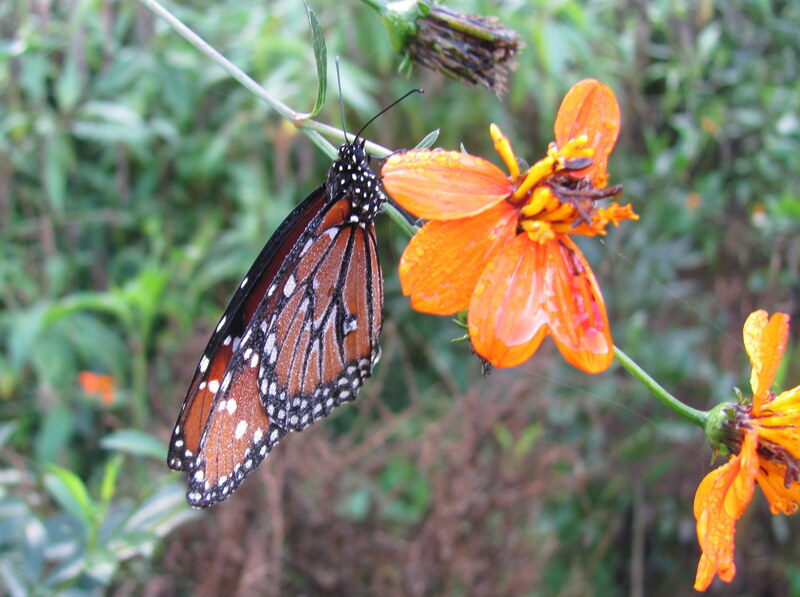 This was my third trip to Mexico and second to west Mexico, so I was hopeful for a few lifers but mostly I was looking forward to just spending time with birds with which my experience is limited, getting some sound recordings, looking at butterflies, and looking at Nutting’s Flycatchers that aren’t from one family group! 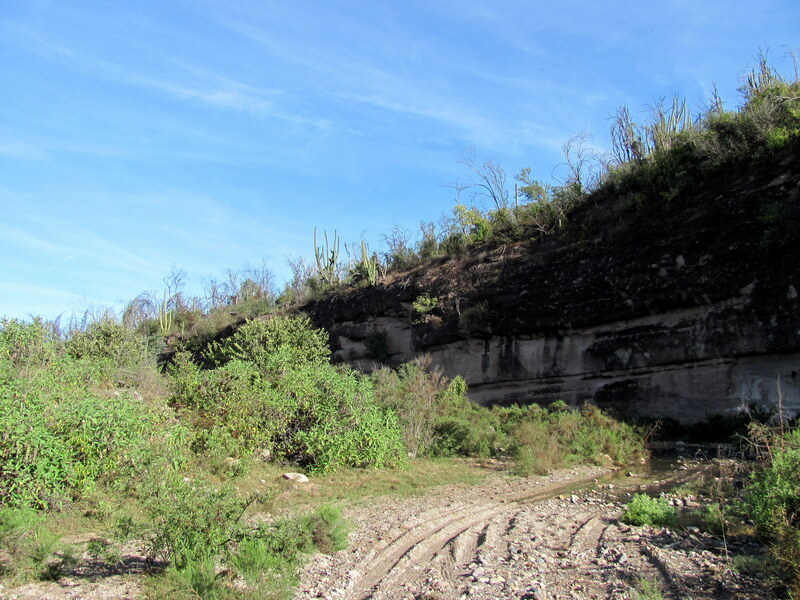 We spent the day before the count hiking Arroyo Mentidero, which drains into the Rio Cuchujaqui just outside of Alamos. 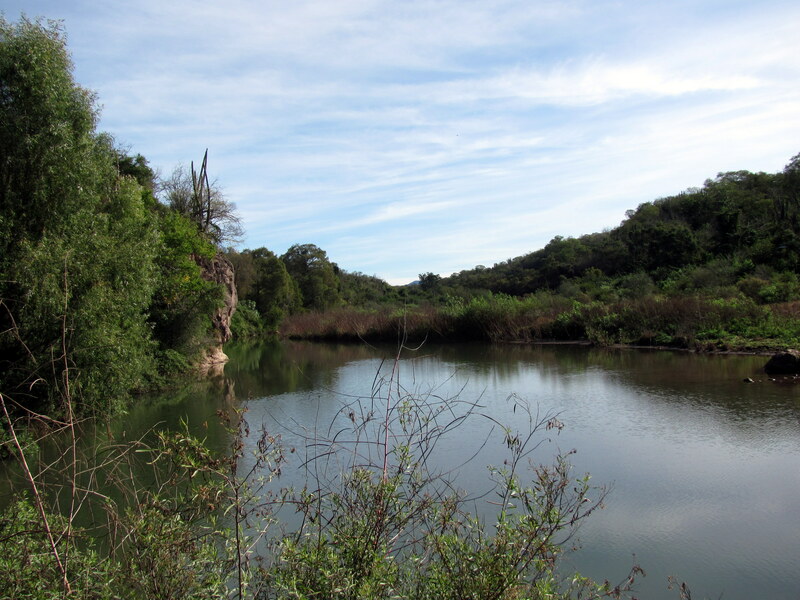 The area was incredibly birdy and diverse, and if we didn’t have birds to look at we were always distracted by plants, butterflies or scenery! The birding highlight was a lifer, a flock of Purplish-backed Jays which flew overhead, giving great views of birds of different ages. Later, they were calling from a hillside next to the river and even perched up for extended views. Other great birds included a very vocal pair of Common Black-Hawks, plenty of vocal Nutting’s Flycatchers, two vocal Blue Mockingbirds that even came out in the open for decent views, Streak-backed Orioles in a variety of plumages including a stunning adult male, Five-striped Sparrow, and a very large array of other interesting species. Plenty of them performed for the mic, and I’ll hopefully get to organizing those recordings soon…! 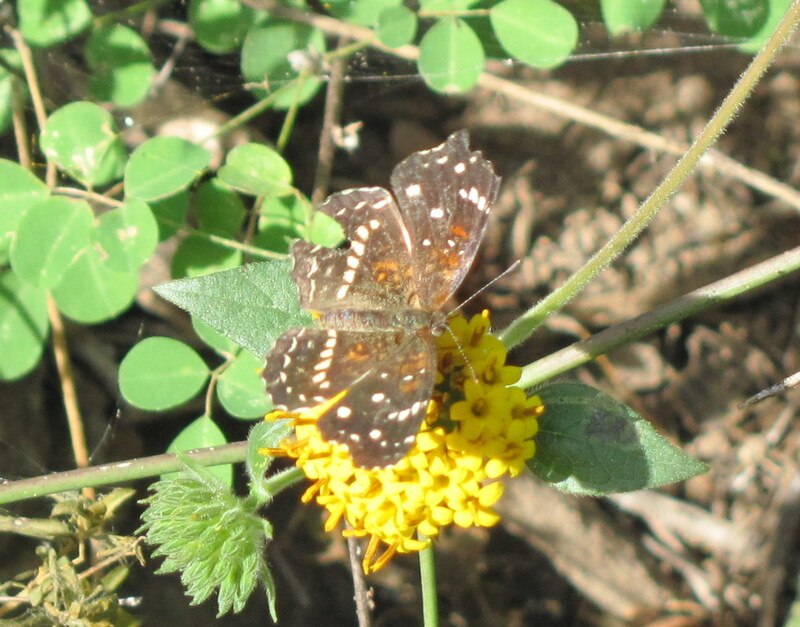 Butterflies started puddling in the afternoon, and I was able to identify 13 species, several of which were lifers. 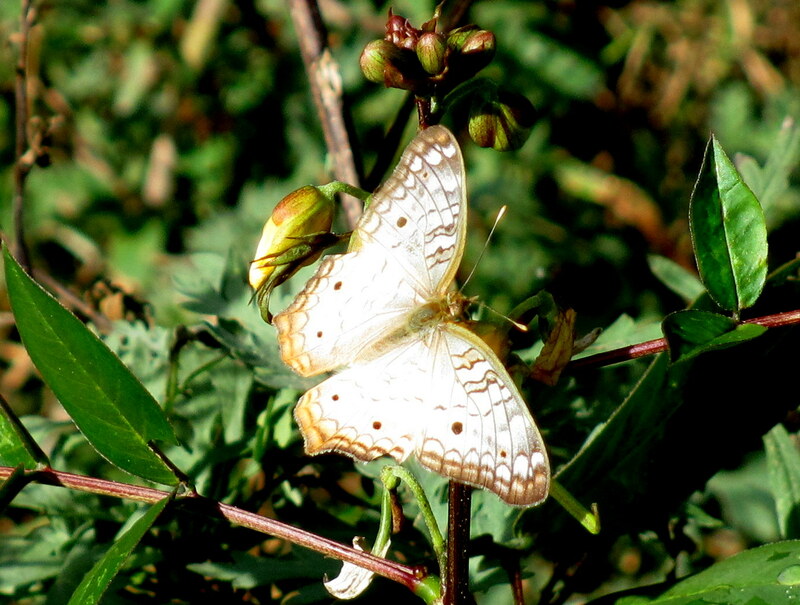 White Peacock, one of my favorites! 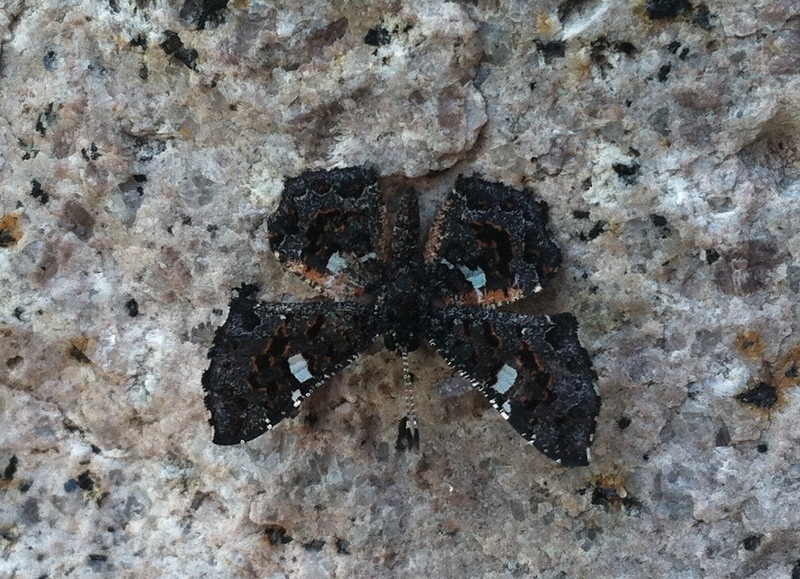 Texan Crescent. 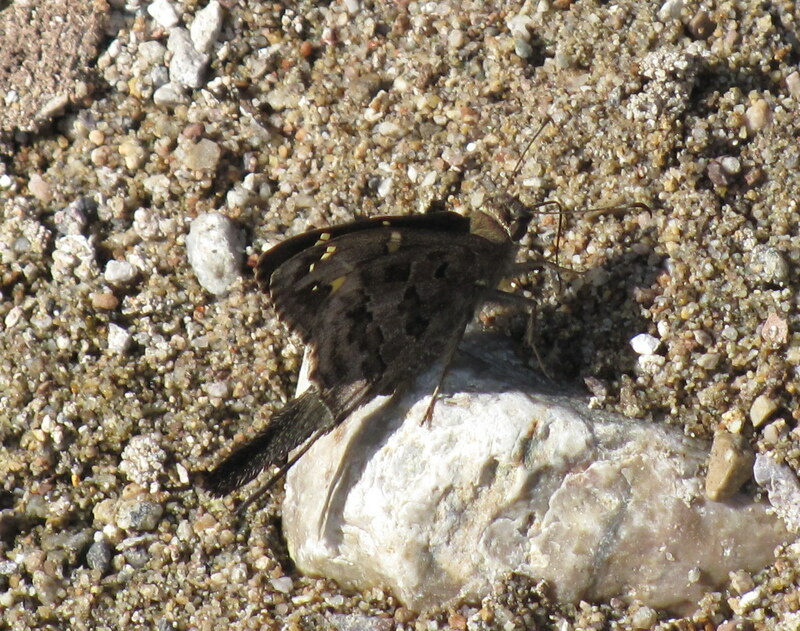 Along with Mexican Yellow, one of the most common butterfly species we saw. 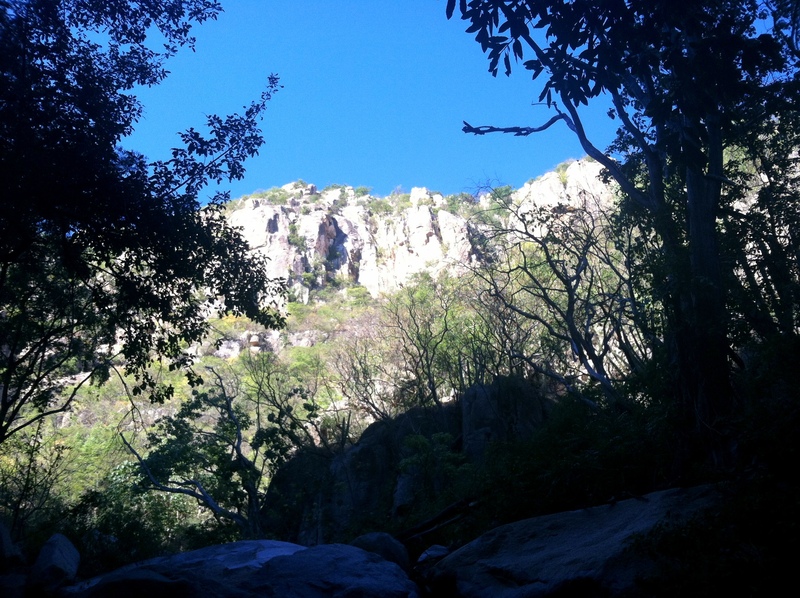 The next day, on the CBC, I accompanied Dave in hiking up Cañón Cieneguilla, a beautiful canyon rising into the Sierra de Alamos. We started the morning owling, with the highlight being spectacular views of a meteor shower! We also had some owls just as the eastern horizon was beginning to lighten: a variety of calls from a pair of Ferruginous Pygmy-Owls, and brief bouts of calling from a Colima Pygmy-Owl and a Mottled Owl. 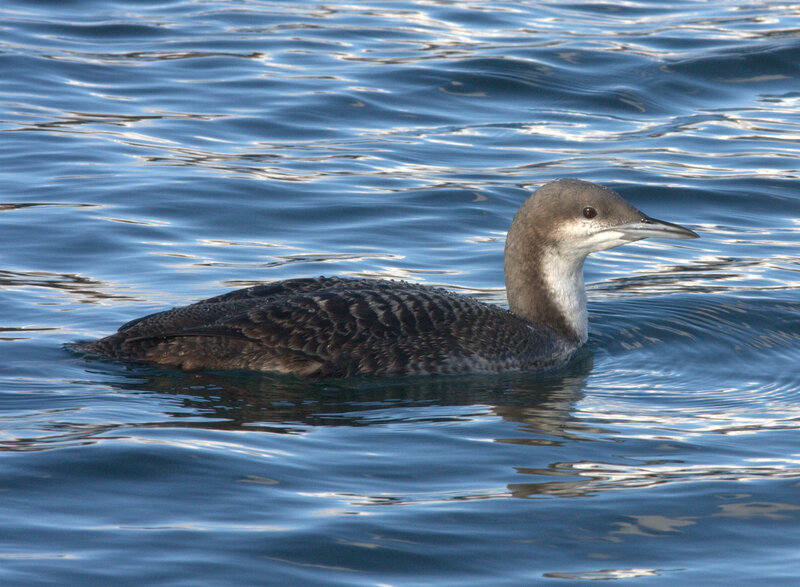 The bird highlight of the day appeared early, flying in and calling once in response to Dave’s FEPO whistles. He immediately recognized the call as sounding like a Greenish Elaenia. 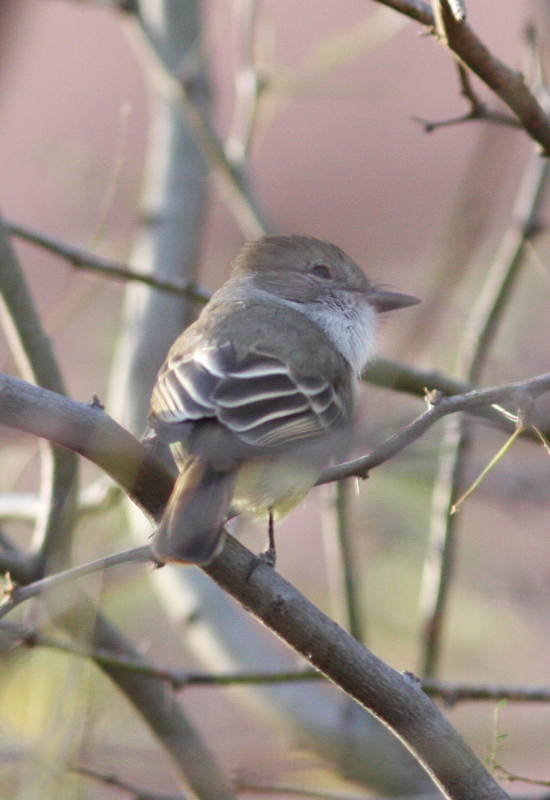 We were both able to get on it, and there it was: a drab green flycatcher which wouldn’t be very exciting, except that it was so far out of range that it has never before been recorded in Sonora! 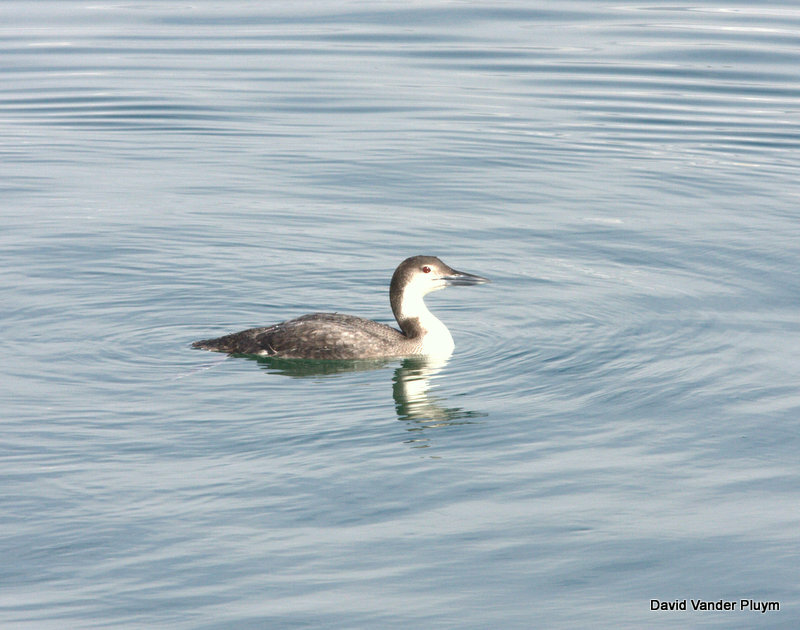 Click to see the day’s eBird checklist which includes Dave’s photos and my sound recording of this first state record! Of course, there were plenty of other avian highlights, although overall Dave noticed that bird activity in the canyon was way down from past years. We did have quick looks at flyby White-fronted Parrots, my second of two lifers on the trip. Black-throated Magpie-Jays accompanied us and shared some great vocalizations and amusing antics. High in the canyon, we ran into some higher elevation species, such as Slate-throated Whitestart, Rufous-capped Warblers and a Brown-backed Solitaire that quietly sang its incredible song once. The “butterflying” was good here, too, of course! 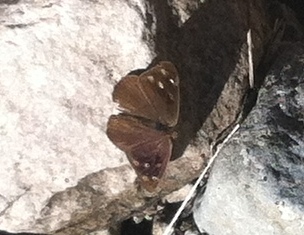 I identified 14 species, including some real lookers like Ruddy Daggerwing. 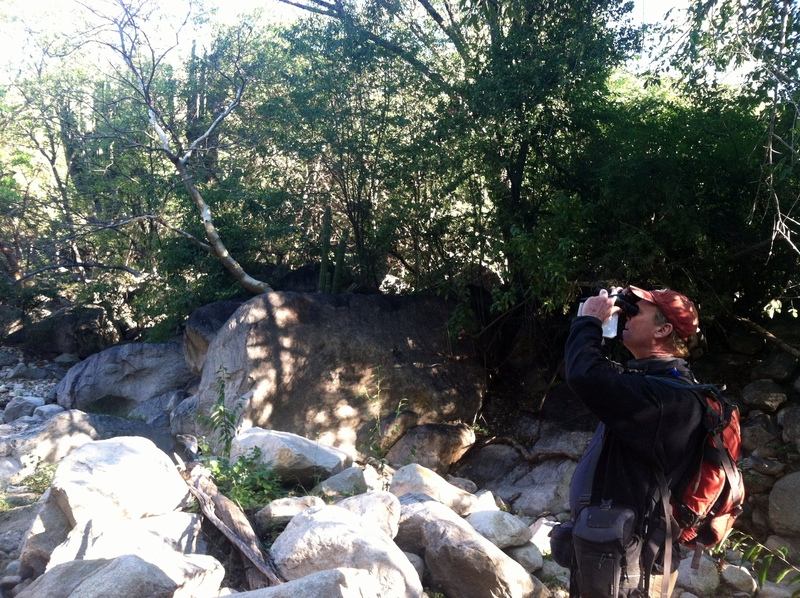 The trip was so much fun, though all too brief, and a great introduction to birding in Sonora. I think I’m hooked! I’m definitely hoping to return for next year’s CBC (and hopefully will stay longer), and would recommend it very highly. Two days of driving later, I woke up at the great, stinking, magical, bird-filled Salton Sea! This is a CBC which I try to do every year, and it’s a different experience every time: you never know what to expect. My assignment this year was the north half of the IID Wetlands, a fairly new managed wetland created by the Imperial Irrigation District. The habitat is being utilized by breeding and wintering rails and bitterns, resulting in numbers of these birds increasing every year on the CBC. I focused on these birds and had good numbers of all the various whinnying, grunting and clacking secretive marsh denizens (except Black Rail; the only one I heard was the tiny one that calls when I get a text message…). 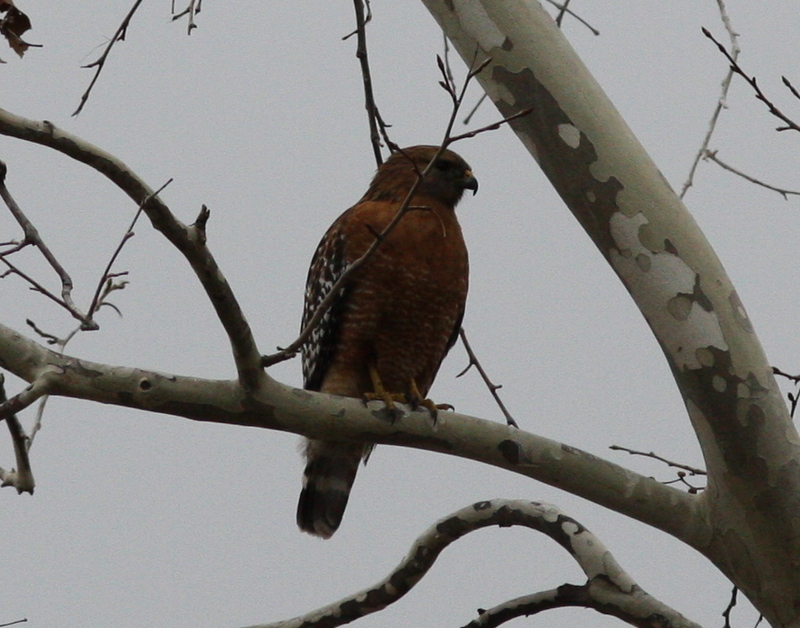 Two Red-shouldered Hawks also contributed to a nice morning of birding. Most of the participants of the Salton Sea South CBC are very avid birders, so the count runs in a half-day fashion, with an early afternoon compilation followed by a rush to chase all the great birds seen that morning. 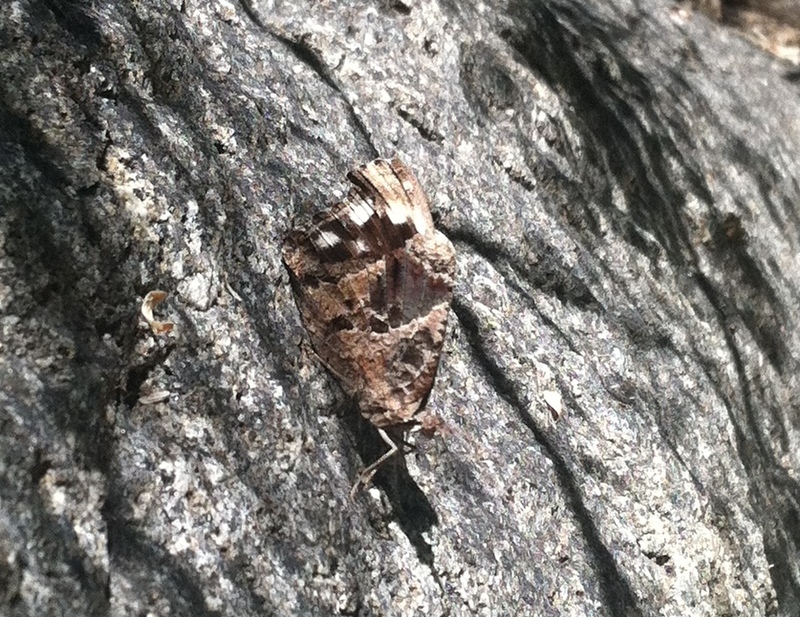 I was able to chase a Yellow-bellied Sapsucker, a Red Phalarope, and a Long-eared Owl. 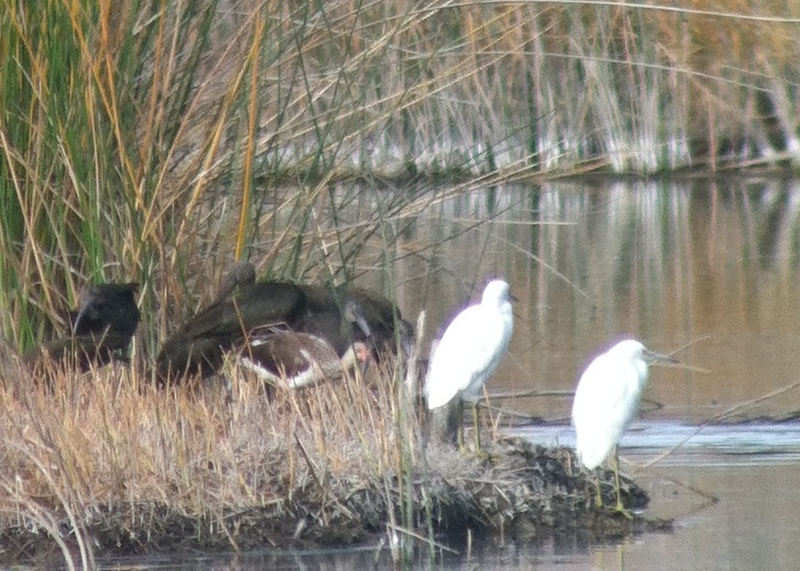 David and I decided to stay in Yuma that night, and woke up bright and early to look for something even better: a White Ibis that is wintering at Yuma East Wetlands! 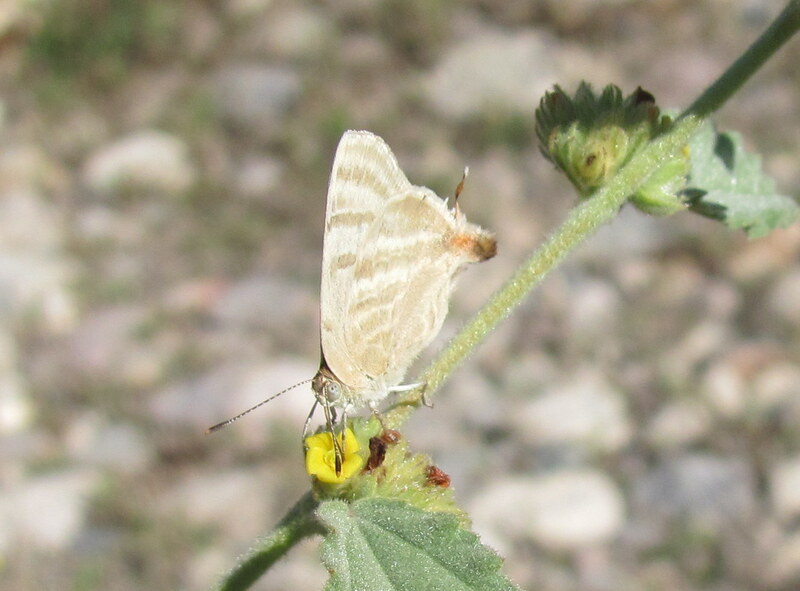 After a break for Christmas and some much-needed sleep, it was back out in the field for the local CBCs! My area for the Bill Williams CBC was the beautiful area between Kohen Ranch and Cougar Point, rarely visited by birders other than those who conduct surveys in the spring and summer. 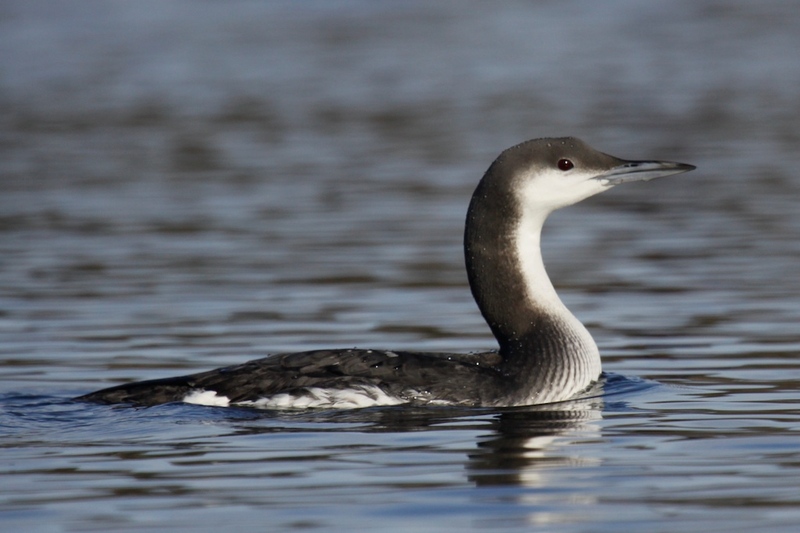 I birded with Rus Hall, a snowbirder from Alberta who is wintering locally. We enjoyed about two hours in the morning of excellent birding, after which the wind came up and shut the birds down. This was the experience reported by just about everyone on the count. Fortunately, we managed to turn up a good list of rarities: THREE Golden-crowned Sparrows, a pair of Northern Cardinals, a Western Scrub-Jay and a Black-throated Gray Warbler! 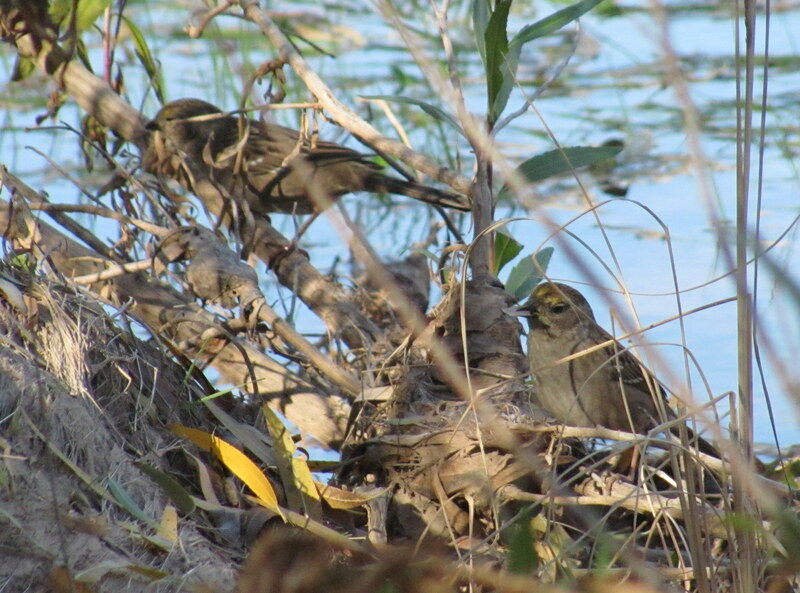 Two of the three Golden-crowned Sparrows we saw. Four was the count total! Yesterday, we finished up our CBC season with the Havasu CBC. I went along with Rus and the count compiler, my friend DeeDee DeLorenzo, on her loop through the southern part of the refuge including Beal Restoration Area and Beal Lake. While landbirds were quiet, Beal Lake came through as usual with all the expected winter shorebirds, plus four American Avocets (rare in winter). 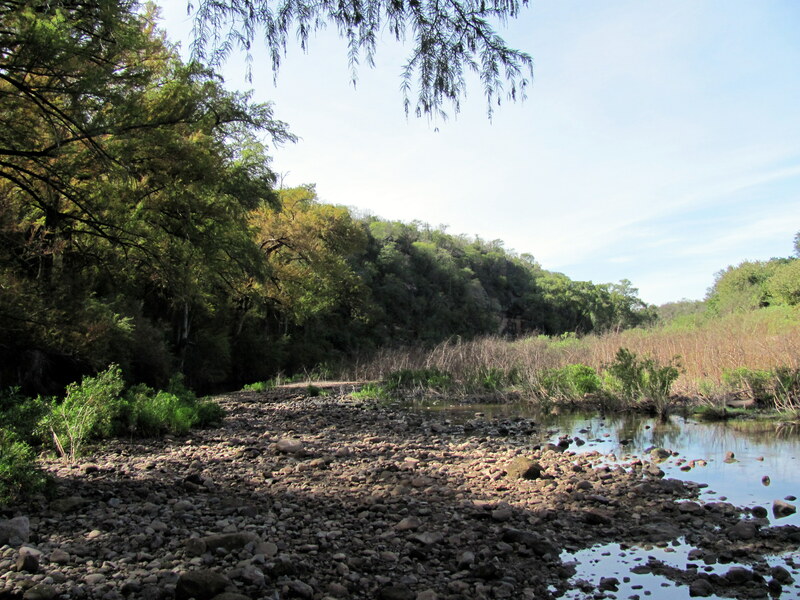 After finishing our area, we briefly checked out some other areas including the dense saltbush at Pintail Slough. 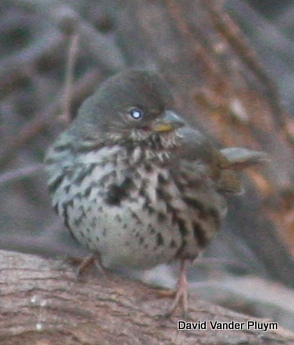 There, we found good numbers of Sage Sparrows, but didn’t feel comfortable identifying any of them to species. All in all, it’s been a wonderful CBC season. Here’s hoping that next year brings more great experiences! 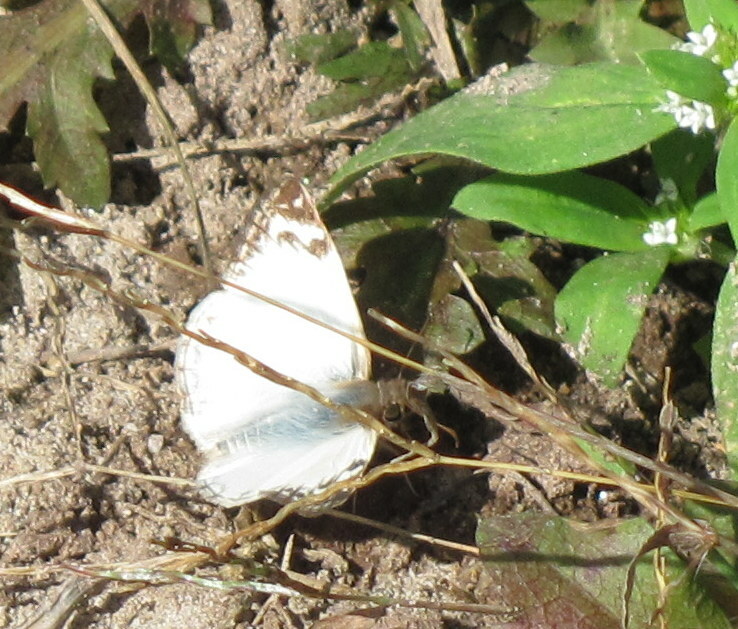 It’s been a busy past couple months with doing vegetation surveys for GBBO as well as trying to get in as much birding as possible (along with the usual ebird and documenting rarities seen that results from such birding), that I have not had as much time to write. Hopefully that will change (I know promises, promises). 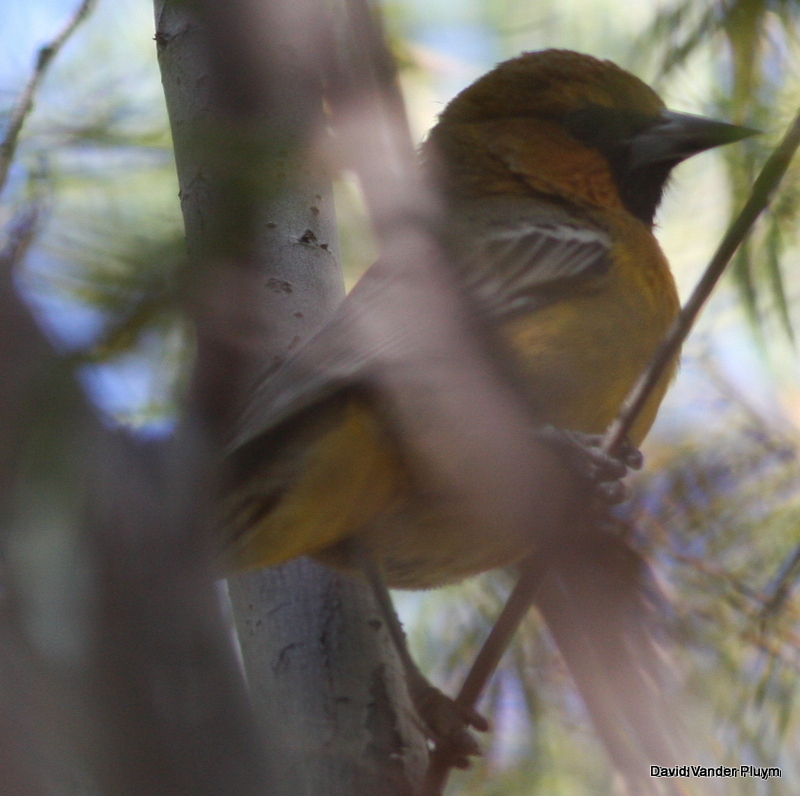 In any case on 4 Nov 2013 during a trip down to the Cibola NWR and CVCA (Cibola Valley Conservation Area) to do some vegetation survey work (and birding) with Jennifer and Michelle Tobin I was fortunate enough to discover a Streak-backed Oriole! 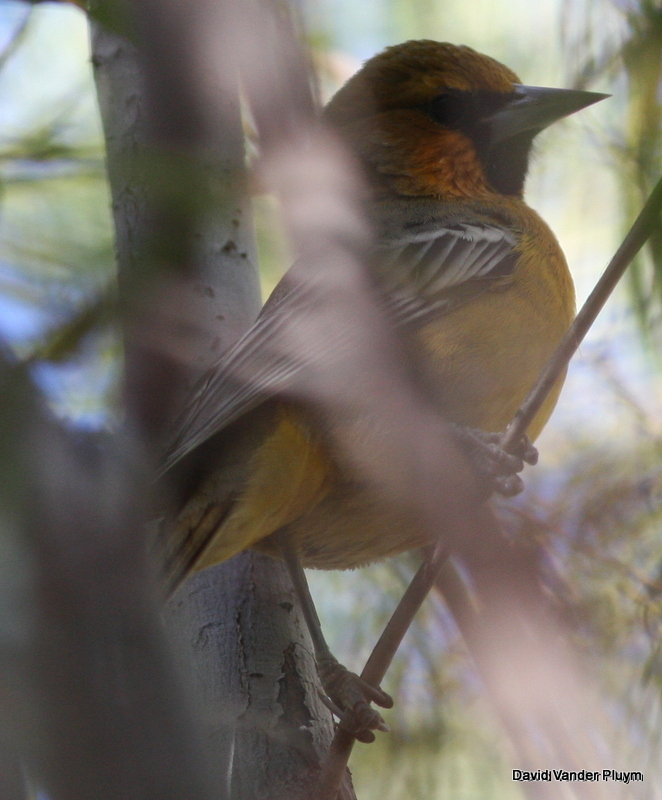 I don’t get to bird this area as often as I like and was hoping for something interesting, so we had scheduled some birding time in with the work (and we always pay attention to birds while working) but in a twist of fate the oriole was found neither while birding or working! 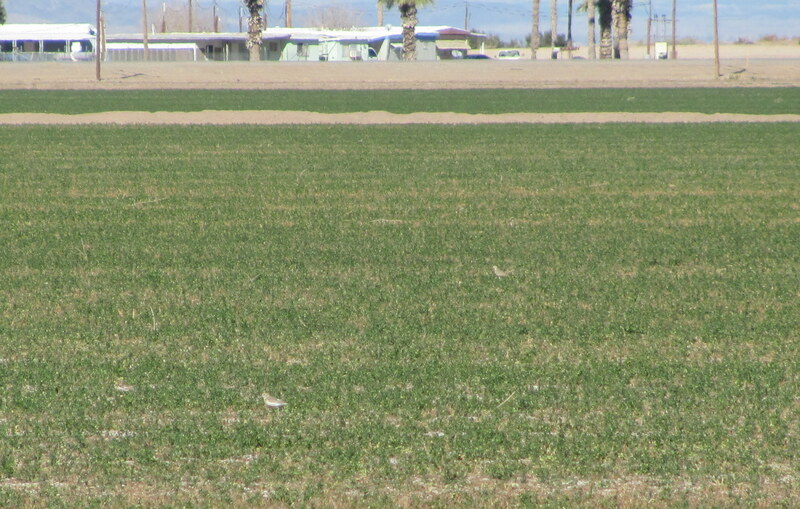 We had been driving through the Parker Valley and then the Palo Verde Valley south of Blythe, checking a few agriculture fields in the hopes of shorebirds, raptors, sparrows, or longspurs (of which we found nothing of interest). These areas are all rather open and after several cups of coffee (as well as the usual water) nature was as they say, starting to call. 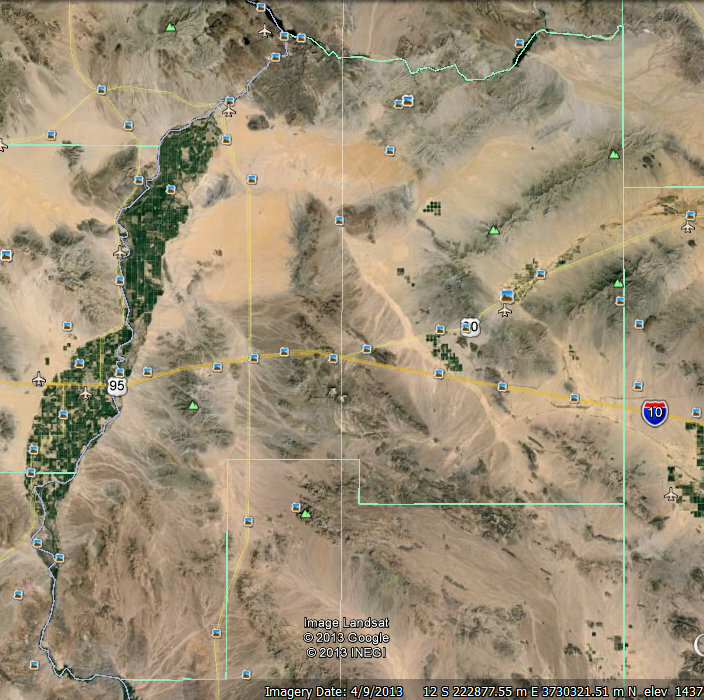 I decided that CVCA just across the Colorado River with its tall, dense trees would make a good spot. As we drove through the vast, open agriculture I could imagine my spot, all picked out. Getting close I mentioned to the Tobins that we would be making a brief spot to answer the call. 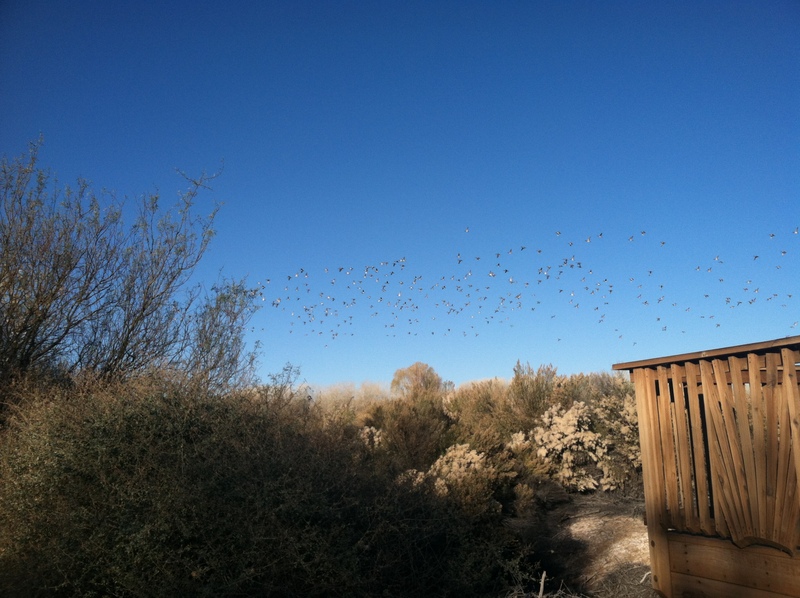 Objections were made, we are close to Cibola NWR and Nature Trail with its port-o-potty. I waved such objections away as the need was growing and the trees were near! I pulled over at my spot and headed along a road into the tree plantings. Immediately I saw and heard several Orange-crowned Warblers and Ruby-crowned Kinglets. Figuring I could wait a few seconds I started sphishing. 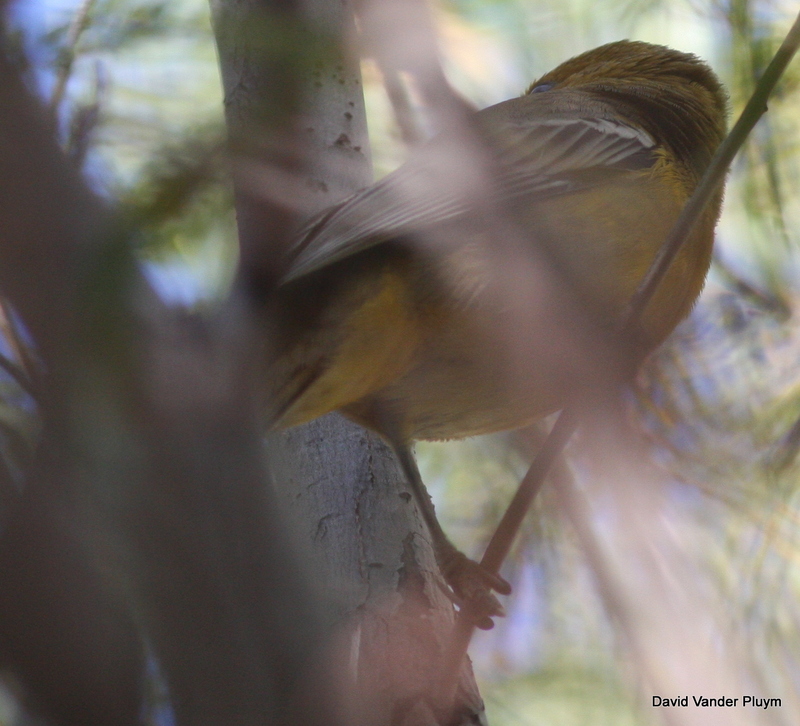 Instantly more birds came in and I was soon surrounded by Orange-crowned and Audubon’s Warblers as well as kinglets. A good mixed species flock always gets my hopes up!